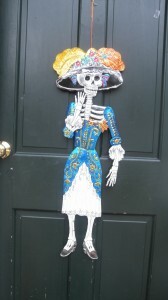 The big, black spider with the blinking eyes is still up on our front lawn and my Day of the Dead “witch” still hangs on my front door. They’re already selling candy canes in the grocery store. Isn’t Thanksgiving next? When I pass the egg nog and “Christmas Blend” coffee, instead of feeling cheery, I feel a rumble in my stomach. It’s a mix between dread and fear that even if I start now, I just won’t get it all done in time. Then I remember last year’s holiday “experiment” and I relax. There’s hope! Last year, I realized that vacations helped to calm the jangly nerves of my family and give a boost to my over-worked husband, but they weren’t enough. We needed a good dose of what my friend Sara Schley calls Radical Renewal (and what Joe Lieberman calls “The Gift of Rest). * Other than through sleep, how did I and my family renew ourselves? It was a good question. So, I decided to try an experiment: I’d go “merrily unplugged” — no computer, no e-mails — between December 23rd, my husband’s birthday and my birthday, December 31st. Before I logged off, I quickly answered the most important e-mails, cleaned off my desk, mailed out the bills. I had fun thinking up and “Out of Office” message (which I found out later was source of a lot of interest, imitation and consternation). When I finally turned the computer OFF (not on SLEEP), I felt like I was closing up a summer home for the winter, turning off the pipes so they wouldn’t burst in my absence. I quickly concluded that this was a big, adventure. The last time I went unplugged like this was when my babies were born. I’ll always remember and cherish that cocoon-like state that emerged as each baby came home: the noise of the outside world kept at bay, the magic of this new human being our only focus. Would I be able to reclaim some of the insulated feeling? Could I actually resist logging in? Could I step off that well-worn path to my computer and back, the one I probably walk 10-20 times a day “to check”? The good news is, I did resist. But it wasn’t easy. For the first 48 hours, I felt twitchy, my own version of EAW, e-mail addiction withdrawal. In the end, I found it easiest to stay out of my office. As my nervous system began to settle, I watched what was happening around me. I sat down on the sofa one after to write Christmas cards, and stayed there. There was no “just a second, I’ll be write back” to check my e-mail. I just sat. I noticed my three children, ages 5, 9 and 12, gravitate to the sofa, and stayed, orbiting in and out of my bit of celestial space. My typical restless, chattering, list-making mind – what the Buddhists call “Monkey Mind”– began to settle. By the third day, I was giddy with a sense of presence, as if my whole center of gravity shifted my head to heart and belly. The folks who needed to get in touch with me, did. The e-mails that weren’t urgent, just accumulated, like letters in my mailbox. At first I dreaded thinking about the number of accumulated e-mails, but then I reminded myself that if there was anything urgent, they’d call me. This unplugged idea was working! Six days in a flaw in my system showed up: my husband took my two boys skiing in a low-cell coverage area in Vermont. Essentially, we were both off the electronic highway — me intentionally, him unintentionally – for two days. Anyone with kids’ sports schedules knows, that the schedules can change on a moments notice, and the way you learn about those changes is through e-mail. So, neither one of us got the coach’s e-mail until it was too late. So that one fell through the cracks (although the coach could have called). When the New Year began, my patience level was way up, my anxiety level was way down and my capacity for deep thought was back again. Did going unplugged work for me? You bet. Getting some good sleep helped too. Now we’re headed into the holidays again, and it feels good to know I’ll be going unplugged again soon. But I also realize, that just as Sara and her family unplug for Shabbat on Friday night, there are more frequent ways I can my family can unhook, unplug, and just relax and renew. As we head toward the holidays, the kids are pushing to get Mom an iPhone. I’ll become more efficient, yes, but…I’ll let you know how that one goes. *I could write a whole blog about Edith Cobb, (b. 1895), another inspiration for building renewal into our every day lives. In her book, The Ecology of Imagination in Childhood, Cobb writes of the body’s natural “homeostatic wisdom”. I learned about homeostasis in school, but never thought to look for the wisdom in it. 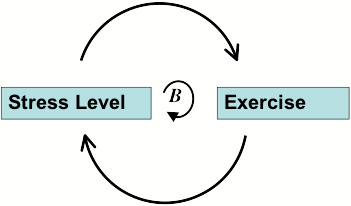 Cobb referred to those cyclical “behavioral patterns of regulation and integration.” (P. 43), such as respiration, that allows us to maintain equilibrium. It was this state of equilibrium that allows species survive and thrive. Maintaining equilibrium means a constant set of adjustments. 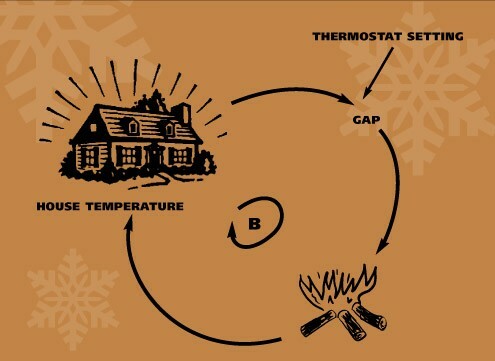 We know this well when we think about how a thermostat works. If the temperature in a house is too cold, the thermostat will turn on the furnace, seeking to reach the desired temperature (or goal) as set on the thermostat. The furnace raises the temperature until the goal is reached and eventually the furnace shuts off. This “self-regulating” or balancing system maintains a goal, in this case, a steady temperature in a room. If we look at ourselves, the process of maintaining our temperature is also a self-regulating system. We shiver when we’re cold to warm up our muscles and sweat when we’re hot to cool them down, all the while trying to achieve a steady temperature. So, self-regulating or balancing feedback loops are goal-seeking but they also bring renewal. Think about the dynamics of stress and exercise. For many people, exercise is a helpful way to manage stress. As stress levels kick in, we exercise, with exercise, stress goes down (of course, there are many folks who exercise regularly whether they’re feeling stressed or not). Now my question is: Where are the built-in adjustments that help me and my family to maintain equilibrium? Where are the cycles of renewal in my own life?